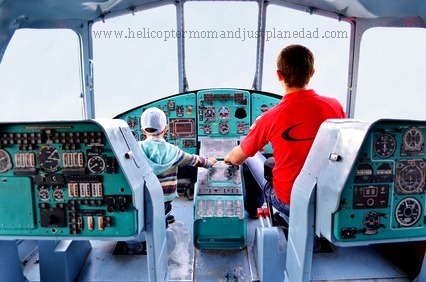 According to the dictionary, helicopter parents pay extremely close attention to their children’s experiences and problems, to the detriment of their children. I’m not sure I understand how being overprotective parents that are close with their children and know what’s happening in their lives can be a detriment. I mean, shouldn’t we be involved with our children’s lives? Isn’t it my job to guide her through life’s experiences using the knowledge I have as an adult? Shouldn’t Just Plane Dad know and care where Beloved is at all times? I don’t know if the ill will directed towards involved parents happened subtly or if some major cause affected everyone’s thinking. I believe the term helicopter parenting has been around for quite some time but it does appear to have been nudged to the forefront again with the rise of the Free Range Kids movement. What are Free Range Kids? Essentially, it’s “let’s not be afraid of most of the world’s dangers since we can’t always control them anyway”. Don’t get me wrong, I am all for letting kids be kids and enjoying some freedoms that we did as children, but I don’t see any reason to lead with the assumption that they WILL be safe. We need to plan accordingly and watch over them on their journey. It is our job to make their surroundings less risky and to stop taking chances with our most treasured gifts. I didn’t birth my daughter to let her raise herself, particularly without imparting my expertise in situations that she’ll be faced with. I don’t want to sit by idly watching her veer down the wrong path with mistakes that will affect her life, when I can instead participate. In my opinion, parents are lazy and haphazard if they believe the appropriate way to teach independence and capability is by waiting for mistakes to happen and then correcting them. They are taking the easy way out; Lord knows it is difficult and time consuming to parent as I do. Me and Just Plane Dad have to think of outcomes before Beloved and her friends do, before the “bad guys” do and before the lenient parents tell her it’s okay to play in the street. Helicopter parents have to insulate their children from harm while still teaching them how to protect themselves. We have to internally fight our desire to say “no” so that we can provide teaching moments; lest we penalize our kids by keeping them in a bubble. Media loves to bash helicopter parenting because they think we are creating incapable, sheltered, scared kids that can’t fend for themselves. In truth, we are doing double duty. We don’t just hope for the best, we ensure it. 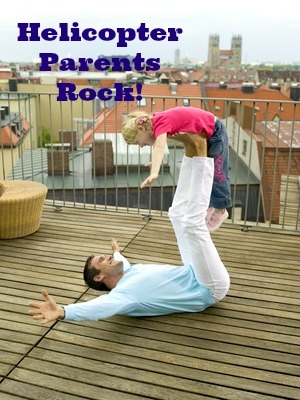 Since even my hubby and I disagree on some parenting rules, it is difficult to find the right balance of guidance and downright pushing. I stay close, very close, to Beloved’s activities and Just Plane Dad is happy to allow more freedoms. After much trial and error, we have learned to strike the perfect balance in our family, or at least according to us. I’m sure I know Beloved feels differently. She is now at an age [sweet sixteen] where she wants total independence. The way we raise her is a far cry from the other parents she knows and she’d often like to put us up for adoption. But ultimately, and deep down, [maybe way deep down], I’m positive that she is grateful for the attention she gets from her parents. I’ve been reading all of the fodder on helicopter parents that is circulating the web and it seems to me that we need to find common ground or more accurately, middle ground. Not many things in life are done at “extreme” limits and parenting shouldn’t be either…that goes for over parenting or free range raising. While I definitely identify with the Helicopter Mom side of helicopter parents, I do recognize the need to prepare our children for the real world like just like other MoMs do. I just don’t think they need to be in any hurry to get out there!